Eicher under Siddhartha Lal is getting ready to conquer more and more frontiers. Even if imitation is indeed the best form of flattery, it is not often that one gets a compliment like this. Listen to Pawan Munjal, the Chairman of Hero Motocorp and the undisputed king of commuter bikes, talking about the revival of Royal Enfield bikes under Siddhartha Lal, the Managing Director & CEO of Eicher Motors: "There has been something peculiar about Royal Enfield and its sublime acceptance that would eventually see Hero also taking the bigger bikes route, especially in international markets," he had said at the launch of Hero's first indigenously-developed scooters in New Delhi in September. It is impossible to disagree with Munjal. For, the revival of Royal Enfield bikes, the single most important reason for Eicher's return from near bankruptcy nearly 15 years ago, has a fairytale ring to it, with Lal playing the perfect knight in shining armour. Royal Enfield - a 19th-century British brand whose legacy of weapons manufacture (the new rifles that led to sepoy unrest leading up to the 1857 mutiny were Enfield rifles) is reflected in its logo comprising a cannon and the motto "Made Like A Gun" - has been the single-largest contributor to the $1.4-billion Eicher Group's growth over the past decade. Getting into the saddle at the age of 26 in 2000 after doing automotive engineering from the University of Leeds, Lal pruned the struggling operations, which that time had 15 verticals, to just trucks and bikes, giving up businesses such as tractor, components, footwear and garment. "Though none of these was a market leader, we decided to focus on our critically core automotive business," he said in November, while announcing the company's results for the second quarter, when profit margins touched a record 26 per cent, making Eicher the most profitable entity in the entire automotive space. While Royal Enfield was the world's oldest bike brand in continuous production, for years after Lal took over, it played second fiddle to the much-bigger commercial vehicle business, VE Commercial Vehicles, the country's third-largest truck and bus maker that is a joint venture between Eicher and Volvo. 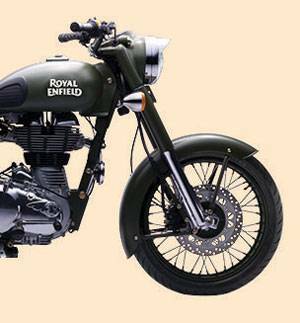 The use of brand name Royal Enfield was licensed by the British Crown to Redditch Company in 1890. The motorcycles started selling in India in 1949. In 1955, the government started looking for a suitable motorcycle for its police forces and the army for patrolling the country's borders. Bullet 350 was found the most suitable for the job. It ordered 800 units, a big order for that time. Thus, in 1955, the UK-based Redditch partnered with Madras Motors for what was called Enfield India to assemble 350-cc Bullet bikes under licence in Chennai. Madras Motors owned a majority stake in the company. In 1957, tooling equipment was also sold to Enfield India so that it could manufacture components and start full-fledged production. Royal Enfield UK stopped production in 1970 and was dissolved in 1971. However, Bullet 350 continued to be manufactured in India. By the 1980s, it was even exported to Europe. In 1990, Enfield India entered into a strategic alliance with the Eicher Group, and later merged with it in 1994. It was during this merger that the Enfield India name was changed to Royal Enfield. Lal set about to change this. He initiated a retooling exercise, moving from carbureted cast-iron engines to all-alloy unit construction that allowed integration of multi-valve electronic fuel-injection systems. The technological leap minimised the technical flaws associated with heritage bikes such as Royal Enfield. The retooling, done at the company's only plant in Chennai, was integral to Lal's plans to make Eicher the largest mid-sized bike company in the world. The plan seems to be working to perfection. Eicher is fast emerging as a global player in the mid-sized motorcycle segment. It is already a formidable brand in the UK, its largest overseas market, while sales are surging in Germany, Spain, Columbia and Dubai. It now plans to enter Thailand and the highly-lucrative US market, for which it is establishing its North American headquarters and a dealership in Milwaukee, Wisconsin, where it plans to sell Bullet 500, Classic 500 and Continental GT 535 Cafe Racer, meeting the needs of what it considers as the underserved mid-size US bike market. "Once the production was in place, from 2014, we started expanding our global presence. After entering every major bike market in the world - Paris, Madrid, Jakarta - we finally plan to open our first exclusive branded retail store in the US in 2016," says Lal. The company has embarked upon a plan to double production to nine lakh bikes over the next two years, which is quite spectacular given that it had sold just 20,000 units in 2000. "There is an unprecedented demand from all major markets. In our pursuit to emerge as the world's favourite mid-sized motorcycle company, we are doubling our capacity, and plan to introduce new models and variants to cater to diverse global markets and demanding customers," says Lal. The company has embarked upon a plan to double production to nine-lakh bikes over the next two years, which is quite spectacular given that it had sold just 20,000 units in 2000. All this has made sure that while Eicher may have nothing on the scale of the multi-million production capabilities of a Hero Motocorp or a Bajaj Auto, Lal is laughing all the way to the bank. Eicher has posted a staggering 42 per cent per year growth over the past five years. The bigger rivals have not managed even a fourth of this. Operational profits have risen 109 per cent a year on average for the last three years. Robust profits have given the company strength to invest in new technologies and enter international markets. Reflecting this, Lal has shifted base to London, close to Eicher's international technical centre in Leicestershire, to oversee two new platforms being developed for global markets. "The centre will build trend-setting mid-sized bikes with a global appeal. We are working on many new platforms for these bikes to meet the diverse needs of the various markets we are serving," says Lal. Eicher's success under Lal is acknowledged even by rivals. "Royal Enfield is one of the best known domestic players that has replicated the success of global companies to have a transcontinental acceptance," says Vimal Sumbly, the CEO of British marquee brand Triumph in India. Lal is trying to create a similar niche in other segments where Eicher has a presence. He has entered into a strategic equal joint venture with US-based Polaris Industries to make multi-purpose personal vehicles that will revolutionise rural mobility. The first game changer product, Multix, a light track, has already been introduced. Also, the new range of Pro Series trucks & buses is helping it ward off rising competition from new international players like Bharat Benz and MAN Trucks. It seems Eicher will continue to surprise investors for many more years.